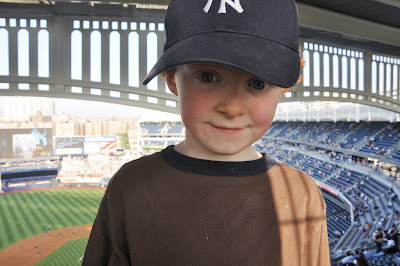 Bozo #1 & I have been to a few Yankee games together. Bozo #2 was too young to appreciate it at the time. But, last night was his turn. Again, courtesy of 2-Pops! He's still is a bit young to get into it. The highlight of his evening was his blue cotton candy. But, we had fun & I know he will remember it for a long time. He's especially enjoying the fact that he saw the new stadium before his brother. It's not often that he gets to do something first. those pictures of miles are too cute! glad you guys enjoyed the game. Miles is starting to look like you and not Joey. joey ziegahn? too funny! love the pics! and penny too. you should see her face light up shen she sees cousin miles! Boys are cute, and I'm glad you all had a good time. Atticus went to his first Tiger game in April and loved it. 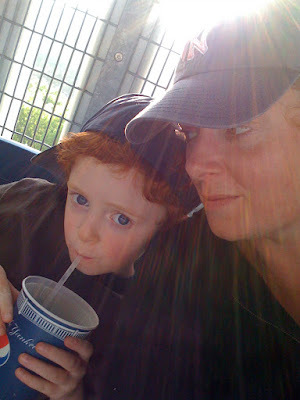 He'd been to some Loons' games when we lived in Midland, but he was so little he didn't know what was going on.